A living mulch, or cover crop, is a low-growing plant used in the vegetable garden as a. It is usually referred to as a cover crop because that is exactly what it is doing – covering the ground. The cover crop is usually grown in between rows or around plantings. Using a living mulch is a form of companion planting where plants are grown together in order to benefit each plant. There are many benefits of growing living mulch in your garden. Living mulch can provide shade, help retain soil moisture, control weeds, help reduce disease issues, and help to control some insect pests. The best reason to use living mulch is because most cover crops, such as clovers, feed nitrogen into the soil which in turn benefits your vegetable plants. Typically the cover crop is left in place until the end of its life cycle, and then is tilled or turned over into the garden soil for the next growing season. Using a living mulch can also give your garden a better appearance. Living mulches are not appropriate in every situation. Make sure the cover crop is complementary of the other plants around it before planting. Never use a cover crop that is susceptible to the same diseases as the main vegetable plant. Make sure your vegetable garden is free of weeds before planting any vegetables or cover crops. 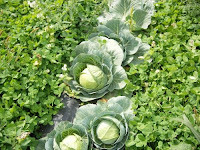 Let the main vegetable grow alone for four to five weeks. This will help keep the cover crop from competing with the vegetable. Take care with planting cover crop seeds. Do not broadcast the seeds as this could lead to the cover crop dominating the garden. Take care when planting cover crop seeds between planting. Sow seeds in dedicated areas. Although planting cover crops in your garden can be a great idea, remember that they can and will compete somewhat with your vegetable plants, so use carefully. For more information on mulching practices, contact Ronnie Zamora, Extension Agent CEP-AgNR at the Cooperative Extension Program office at 500 N. Britton Rio Grande City, Texas, (956) 487-2306.